Hypsirhina maculosa: Blanford, 1881: 226. Hypsirhina blanfordii: Boulenger, 1890: 377. Enhydris maculosa – Smith, 1943: 387. Gyiophis maculosa Murphy and Voris, 2014:21. Diagnosis: This species has three pairs of chin shields, 123 ventral scales, and a dorsal pattern of blotches without a stripe. All of which will separate it from G. vorisi which has more than 142 ventral scales and a stripe on scale rows 2–4. Etymology: The name maculosa is probably derived from the Latin macula, which means spots or spotted. This is in reference to the dorsal pattern of the species. 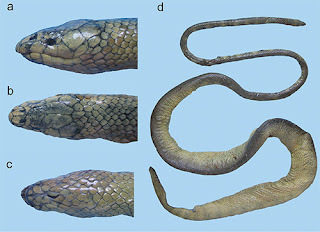 Distribution: Gyiophis maculosa is endemic to the Ayeyarwady River delta of southern Myanmar. The type locality of this species is Bassein (~16°46’N 94°44’E), the capital of the Ayeyarwady Division and is not in the Pegu District of Myanmar (Burma) as suggested in Blanford’s original description. However, Sclater (1891b) questioned Burma as the source of the specimen and Wall (1924) commented that the locality was “dubious,” but offers no further explanation and it is unclear if he was referring to the type locality, questioning where the type specimen was actually housed, or most likely referring to the confusion created by Blandford by placing Bassein in the wrong District. Wall saw a second specimen because he gives ventral counts as “122 to 125” and subcaudal counts as “33 to 45;” he stated that the species is known from Pegu (Myanmar) citing Blanford, but questions Bassein citing Sclater. There is a town with the name Pegu (~17°20’N 96°29’E) which is about 180 km (NE) from the town of Bassein. Whatever the source of these specimens, it seems probable that they are from the Ayeyarwady drainage/delta system in southern Myanmar. Gyi (1970) complicated the distribution of this species, he gave the distribution as “…Burma, China and Sumatra,” and he listed specimens as: Burma- Maubin (KU 92395 and others); China (no locality ANSP 5095-8); Indonesia (Nais Island – MCZ 18390). Zhao and Adler (1993) found the ANSP specimens to be Enhydris chinensis. The MCZ specimen Gyi reported from Sumatra actually lacks locality data and does not appear to belong to this species since it has 27 scale rows on the neck, 148 ventral scales, and a different color pattern; thus the Indonesian and China localities given by Gyi are in error. Additionally, Gyi’s specimens from Maubin do not belong to this species; they are conspecific with MCZ 18390 and represent an undescribed taxon. Thus, G. maculosa is a Myanmar endemic and probably restricted to the Ayeyarwady delta and its drainage system. The specimen examined by Wall appears to be BMNH 1913.6.12.1. This snake has 123 ventral scales (Blanford’s type specimen supposedly has 125 ventral scales), and it has 32/31 subcaudal scales (Wall’s specimen had 33 subcaudal scales). The type specimen of this species appears to be lost (Das et al., 1998). The head is distinct from the neck, the body is cylindrical, but about 30 ventral scales anterior to the vent it becomes laterally compressed. The tail is relatively short, about 12% of the SVL. This description is based upon a single female specimen BMNH 1913.6.12.1, the total length is 308 mm, and it has a 43 mm tail. On the head the rostral scale is pentagonal, notched, and about as broad as it is tall. The nasals are in contact and are semi-divided; the nasal cleft touches the first labial. The nare is located in the middle of the nasal scale. The internasal scale is single, diamond-shaped, and isolated from the loreal (Plate 21, Figure B). The two large prefrontal scales make broad contact with the loreal. The frontal is pentagonal and almost as long at the parietals. There is a single supraocular, a single preocular, a single postocular on the right and two post oculars on the left (Plate 21, Figure C). Upper labials number eight on both sides; none of these are divided; number eight is the smallest number seven is largest; 1 - 3 contact the loreal; the fourth enters the orbit. The primary temporal scale is single and taller than broad. There are two secondary temporal scales and the ventral scale is larger than the dorsal scale. The primary temporal contacts the seam of upper labials 6 - 7. On the chin the lower labials number nine on the left and 10 on the right, number six is the largest. There are three pairs of chin shields, the first pair is broad and is contacted by lower labials 1 - 4. The second pair is much smaller than the first and separated by a pair of smaller scales. The third pair is barely distinguishable from the gulars. On the body the dorsal scale rows on neck number 25, they number 25 at midbody, and 22 in front of the vent. The dorsal scales are smooth, lacking keels, apical pits, and striations. The first few rows of scales toward the posterior of the body are extremely ovate. The ventral scales are narrow (about twice the height of a nearby dorsal scale) on the anterior and posterior of the body, and broad (about 3.5 times the length of a nearby dorsal scale) at midbody, they number 125. On the tail there are 11 dorsal scale rows. The subcaudal scales number 32/33 in the single female. The dorsal scales on the tail are similar to those anterior to the vent. Color and Pattern. The outer edge of the ventral scales and the first row of dorsal scales have zigzag stripe that runs the length of the body. The dorsum has six irregular rows of spots. Each spot is a cluster of three to five scales with dark brown pigment. They are found on scale rows 2 - 4, 5 - 6, and 8 - 10. Each ventral scale has a mid scale spot of dark pigment. Thus, the overall appearance of the ventral surface is that the snake has three stripes. This snake is known from only two known specimens, nothing is known about its habitat, diet, or reproduction. Based upon its known distribution it appears to be endemic to the Ayeyarwaddy freshwater swamp forest ecoregion of the Indochina Bioregion (Wikramanayake et al., 2002). Note that Smith (1943) was in error when he stated that Flower discussed a litter of these snakes from Kedah, Malaysia; Flower was discussing E. bocourti, not this species. Specimen examined: (n=1) No Data: BMNH 1913.6.12.1.